Yu-Gi-Oh! 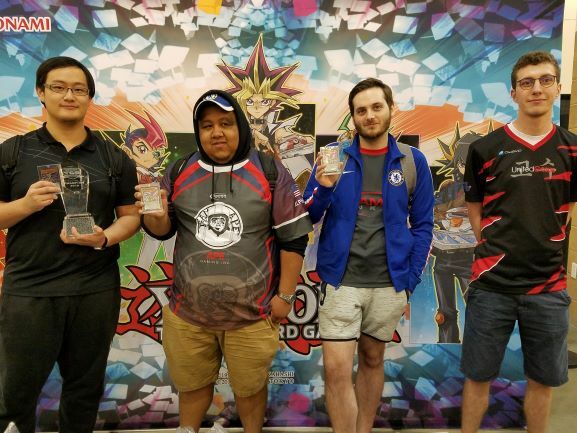 TCG Event Coverage » YCS Pasadena Top 4 Duelists! Home > 2018/11 - Pasadena, CA, Yu-Gi-Oh! Championship Series	> YCS Pasadena Top 4 Duelists! Here are your YCS Pasadena Top 4 Duelists! From left to right, it’s Shunping Xu (1st), Aldo Garcia (2nd), Jeff Jones (3rd), and Adrian Koch (4th). Congratulations!